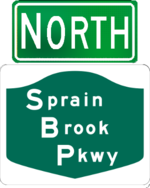 The Sprain Brook Parkway bypasses White Plains and the divided highway portions of the Taconic and Bronx River Parkways. The parkway was first proposed as an extension of the Taconic, but was faced with numerous public opposition. The proposal was revived with the development of a new state park as a means to reduce traffic on the Bronx River Parkway. The parkway was maintained by the East Hudson Parkway Authority until that authority was dissolved.